To see women, from generation to generation, flourishing in Kingdom work. for practical and public engagement. but our enduring mission remains unchanged. ADM and Mary Andrews College stand on a legacy of inspiring women – courageous pioneers, who lived out the word of God in practical ways. As women of God today, we have the same mission: to speak God’s truth into the hard places, writes Director of Studies at MAC, Rev. Jackie Stoneman. In 2016 we celebrated the 125th anniversary of Anglican Deaconess Ministries (ADM). ADM is the parent organisation of Mary Andrews College. It was a significant time to reflect back on the amazing training and ministries in which this organisation has been involved. The organisation was originally the vision of the Rev Mervyn and Martha Archdall. 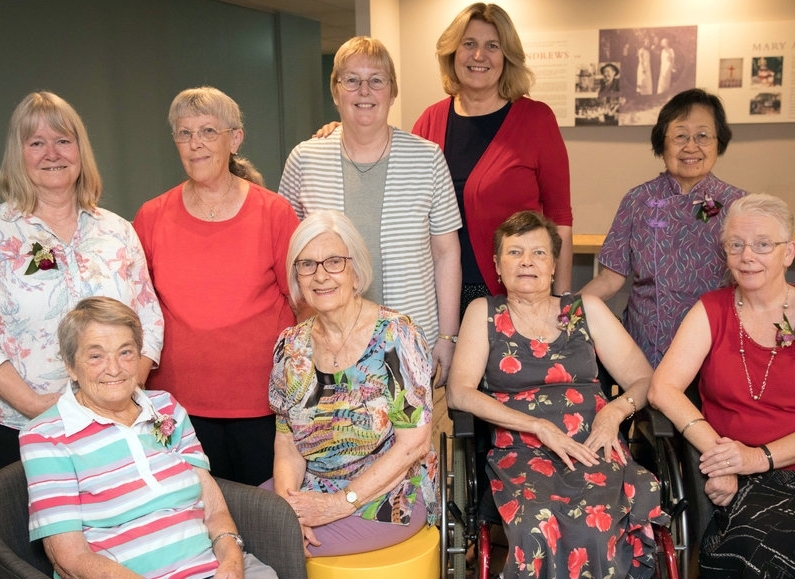 They saw the work of deaconesses in Germany and were inspired to encourage women in Sydney to undertake a similar ministry. The history of the women who subsequently offered themselves for service is truly inspiring. There was a recognition that all ministry needed to be grounded in God’s word. And so, Deaconess House was established (which is now Mary Andrews College). These women who trained were courageous and, in many cases, pioneering. They lived out the understanding that God’s word was not just for our heads. It was to permeate one’s heart and find expression in our hands. And so, cutting edge ministries were established. Ministries in difficult places and with broken people. Schools were established in disadvantaged areas. They set up homes for children and adolescents in need, including a home for girls who had been referred by law courts. They provided training to uneducated women so they could find employment. They established a hospital network that particularly cared for the dying. These women reached out into their communities with the love of Jesus through word and care. For us as an organisation, it has been a helpful time of reflection and planning for the future. What are we to be in our day? The biblical prophet Isaiah had a deep sense of urgency to share this same challenge with people of his day. Isaiah 58 reveals that people then were confusing relationship with religion. They believed that if they performed some religious activities, then God would respond to them in the way they wanted. But they were actually blind to what God had always wanted from them: a right relationship with him, that was then reflected in right relationship with others. I know at Mary Andrews College we talk about this from day one. Study is not an end in itself! It is an important part of developing a relationship with God. For to have a relationship with God is to become like him. The way we live flows from our deep interaction with God. Just like the women in our history, it flows from the head, to the heart, to the hands. Our actions reflect a heart changed by God. A heart that now notices the broken and the poor and the vulnerable. A heart that is quick to act in love. There is a great paradox here. When our focus is on others, because God has changed our hearts, we receive. As an organisation we have been grappling with some of these issues. How are we to give expression to this? How are we to be encouraging others? As a result, Anglican Deaconess Ministries has been stepping out in some very significant directions. It is important to note, however, that the study and proclamation of God’s word is always foundational to all our ministries, and Mary Andrews College remains an important aspect of this. This year ADM has launched the Mental Health and Pastoral Care Institute, under the leadership of Keith and Sarah Condie. Margo Leach is developing the new Mercy and Justice Ministries. Already, small grants are being provided to churches involved in ministry to Syrian refugees. These ministries give very concrete expression to the practical care that a relationship with God calls us to. It is our hope that many of the students who come through Mary Andrews College will be inspired by these ministries and be enriched in their own ministries in their churches. There is also a deep desire in ADM to raise up women who are passionate about God’s word and are seeking to find ways to engage with God’s world. So under the leadership of Annette Pierdziwol, an ADM Fellows program has been established. An initiative called the Hub has also been established. Here five women who are leading not-for-profits, profits and arts initiatives are meeting together regularly to explore how they can bring gospel-shaped renewal to the areas they are involved in. Kara Martin, through Seed, is involved in mentoring and training these women. Our Annual Funding Event in September also gives the opportunity for people to present inspiring ideas of engagement with the world for the sake of Jesus. A number of financial awards are made on the day that enable these initiatives to be developed. We’re at an exciting stage in our history, as we continue to seek to encourage women to integrate their relationship with God and engagement in his world. We’re calling committed, courageous women to keep working in hard places. We want to inspire, support, pray for and encourage these women. Director of Studies at Mary Andrews College, Jackie has been on the Faculty since 1994. Originally a High School Music teacher, Jackie trained at Moore Theological College and spent the following ten years in parish ministry. She is actively involved in Sadleir Anglican Church, Kairos prison ministry and ministering to women in Myanmar each year. Honour her for all that her hands have done – Proverbs 31:31. ADM stands on a legacy of inspiring women – courageous pioneers who lived out the word of God in practical ways. Our organisation was born from the vision of Rev. Mervyn and Martha Archdall, who were inspired by the work of deaconesses in Germany. They established the Church of England Deaconess Institution, known as 'Bethany' in Sydney 1891. Deaconesses reached out into their communities with the love of Jesus as they served in churches, hospitals, schools and children’s homes. Their ministry work included teaching, encouraging, caring and training. The last deaconess was set apart in 1991, after the role of deacon was opened to women in 1989. Our deaconesses leave us a legacy of sacrificial service and ministry. Celebrating our deaconesses at a lunch at ADM in April 2018. Seated L-R: Dss. Doreen Garrick, Dss. Joan Egan, Rev. Kay Clark and Rev. Clare Percival. Standing L-R: Rev. Gillian Jones, Rev. Jacinth Myles, Rev. Sandra Salmon, Rev. Kerrie Newmarch and Rev. Lay Kum Ho. CEO Kate Harrison Brennan and some of our deaconesses at the 125th celebration of ADM in 2016. Discover more about the lives and experiences of our past and current Deaconesses.